Sweet! We have bee sign! Congrats on the new ones! Can't wait to meet the new bees! Meet the new bees... Same as the old bees. 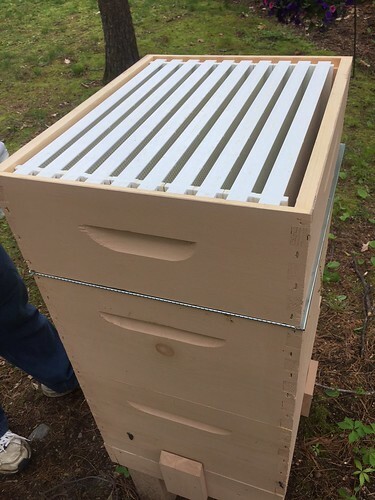 Here are some shots from when Grace & I transferred the frames from the nuc to our hive. In this photo, you can see we've put in a feeder tray (far right). the bees climb down the opening in the tray to drink the sugar syrup. This helps stimulate brood rearing, especially in the spring when resources (flowers) are not yet plentiful. The little orange thing in the on top of the frames in the left corner that looks like a sponge is a pollen patty. The bees can eat that as well as a protein source in the absence of other pollen sources. This is a look inside the nuc as we were transferring frames. It's really a mini hive, and the bees were already working away building comb, storing honey and raising brood. 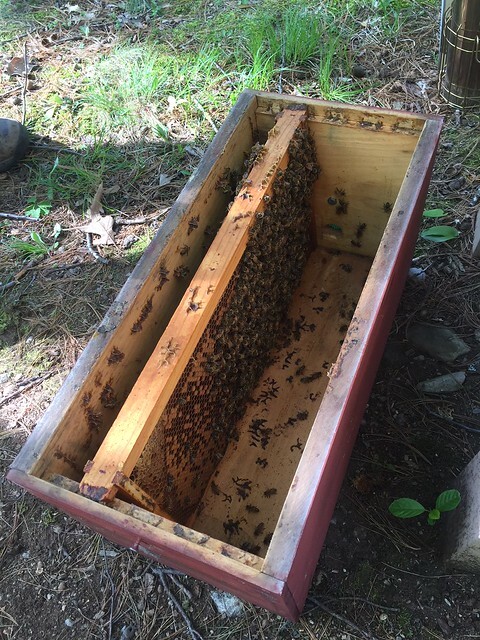 The hope is this head start, plus the leftover resources from my hive last year are enough to jump start the colony and give them a strong foundation for the year ahead. 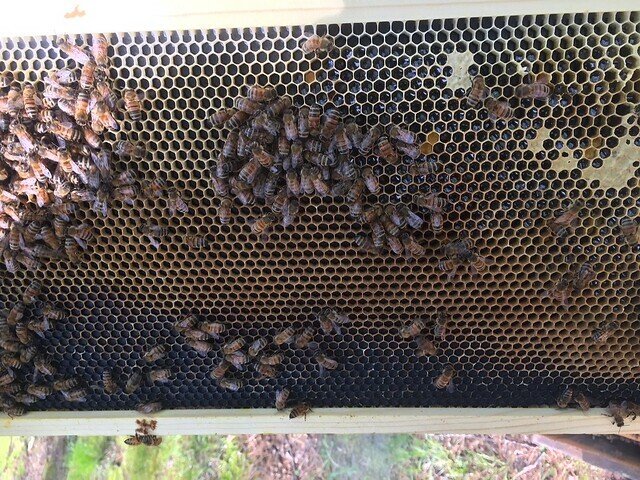 The ladies working on building out comb and packing it with honey. In the upper right, you can see a lot of honey that's "in process". Once they get it to the right moisture content - somewhere around 17% - they add the airtight wax cap so it stays at just the right consistency. My understanding is the bees cap honey in groups of cells whereas brood cells are capped individually. That's why capped honey can appear dimpled whereas capped brood looks to be more raised. Damn, I got fooled again! So sorry Vin about the ladies. So, cool that you are trying again. Can't wait to see the progress. 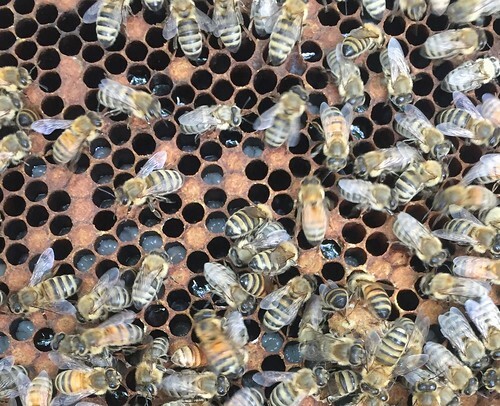 Took a peek in the hive today and we located the queen doing her thing. Big treat for us because this queen is unmarked -- no colored dot on her back like the queen from last year, so spotting her among the thousands of other bees gave us a thrill as well as a confidence boost that we're progressing as beekeepers. On the downside, we were a little too slow with the camera and didn't get a clear pic of her. Hopefully next time! However, we do know she's doing her thing because we were able to see freshly laid eggs and larva that are only a few days old. The egg is the little grain of rice looking thing sticking up in the lower left corner of the honeycomb. Here's a shot of larva that's more fully developed. Based on its size, I'm guessing the bees will be capping these soon. This is the same frame, but further away. 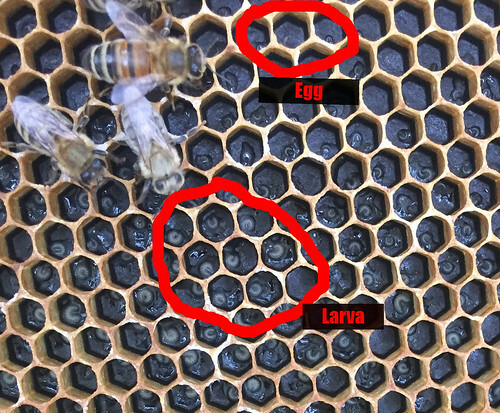 The honey comb that contains the larva had baby bees emerge from them just a few days ago. 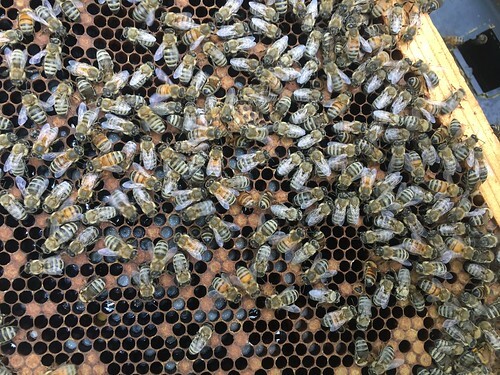 Once the new bee eats through the wax cap and pops out of the comb, she immediately gets to work cleaning and polishing it so the queen can deposit a new egg in it to start the process all over again. Initially the honeycomb produced by bees is a translucent white, but it darkens as it's used again and again. The darker the comb, the more times it's been used to produce a bee. 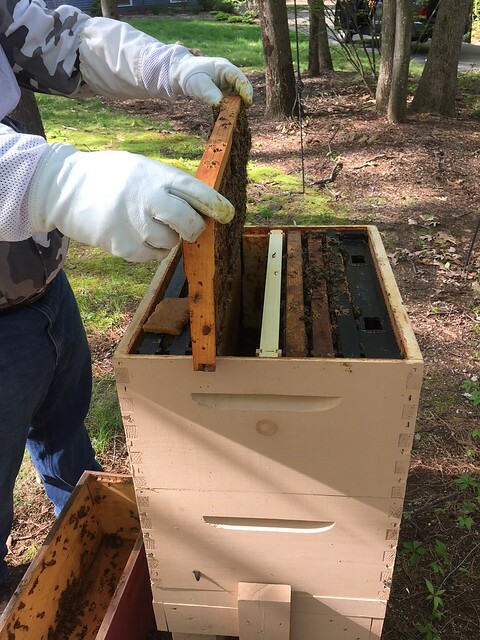 During our hive inspection we also determined that between the new frames we added from the nuc and the leftover frames of honey we had from our bees that didn't survive the winter, our boxes were pretty full. In a situation like this where there's ample resources coming in but nowhere for the bees to put it, you risk having half your hive swarm out and leave to find greener pastures. 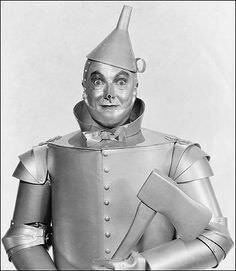 To avoid this, we put on our first honey super. However, we don't want the queen laying eggs up in the new honey box so first we place a screen - called a Queen Excluder - on top of the brood box. 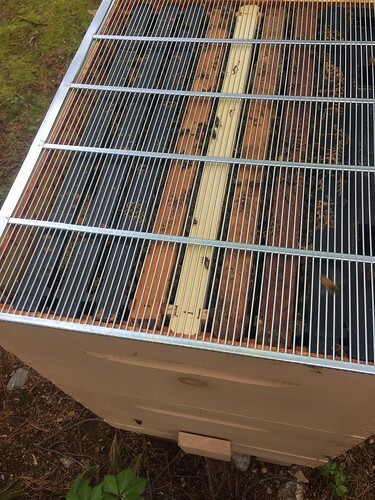 The screen allows worker bees to pass through its slats, but the larger queen will not be able to do so; keeping her in the bottom two hive boxes to keep popping out bee babies. With the screen in place, we add another box of empty frames, called a honey super. This box has ten frames like the brood boxes but isn't as tall. 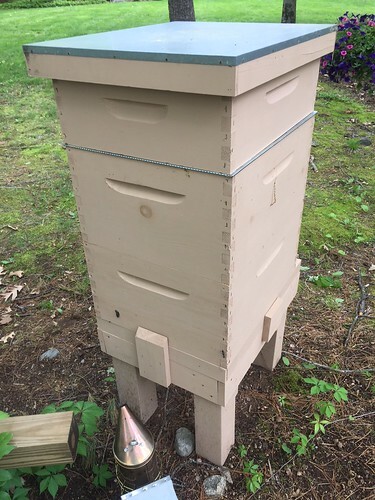 The bees will need to build out comb in this new box, and once they do, they'll begin storing honey there. With luck, we'll have our first-ever batch of honey later this spring!! Very cool! Might I venture so far as to say "sweet"? That's a great tower there. Plenty of room to thrive in that bee castle. Mid March I saw a guy in Walmart buying every bag of sugar they had. A whole cart full. He was wearing a CT Bee Keeper Association t-shirt. He said this winter was brutal on his hives and the bees were starving and freezing. Thought I'd share that so you know you weren't alone facing such a horrific winter. Good luck. Soon they'll be having a feast at the apple orchard. Love seeing the bee progress, Vin! Maybe a little honey for breakfast in July? Nice Vin...good work on honey! ...BTW, is that your hat on the ground in front of the hive in the last pic? There's a ton of bees around my neighborhood, I wonder if someone has a hive nearby? The next two towns to me are both big apiaries. There are signs everywhere not use pesticide because of bees. How far away are those other towns? Bees travel surprisingly far for food. Also, if they are close it's pretty natural for those hives to swarm, which could help them slowly spread out. is that like the 7:00 am, pumps in hand, mussed up hair, long hallway "walk of shame"?